Once again the fact-checking debate is on. This time it’s Concussion featuring Will Smith as the Nigerian-born pathologist Bennett Omalu who diagnosed the repetitive head-trauma disease suffered by NFL players known as CTE (Chronic Traumatic Encephalopathy). During the opening credits of Concussion I noticed the titles were animated to simulate double vision, an intentional and nuanced graphic representation of the film’s central theme. Journalists have honed in on the timeline for Dr. Omalu’s research, settlement cases between the affected players, their families and the NFL. Finger pointing aside, the ex-wife and son of David Duerson (1960-2011) have publicly expressed their disagreement with the portrayal of the Chicago Bears, New York Giants football champion (played by British actor Adewale Akinnuoye-Agbaje) as a “a villain, someone to take the fall” in the Concussion feature. In the film Duerson belligerently blocks Dr. Bennett from a NFL medical conference. Coming from a NFL Players Association Board meeting for retired player’s disability, Duerson tells a former player suffering from CTE “Got a headache? See a doctor” and pushes the player aside. “That portrayal of my brother [in the movie] was absolutely the way he was,” says Michael Timothy Duerson, Dave Duerson’s older brother. This post may be one of the few interviews with Michael Duerson since the film’s release over the Christmas holiday. 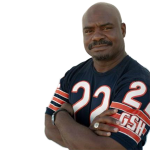 The hunger for conflict ignores a significant development in the tragedy of David “Dave” Duerson’s CTE story – the foundation Michael founded and named for his brother, The Dave Duerson Athletic Safety Fund, Inc.. Initially founded to service K-12 schools in Muncie, Indiana the foundation is seeking to expand through Indiana state and nationwide to install protocols for the education, prevention, and detection of head injuries in school sports. 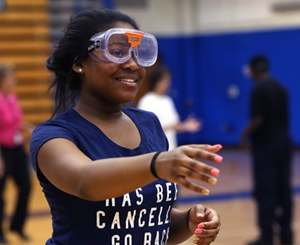 The protocols include special CDC training for coaches, imPACT tests for students in grades 5-12 to provide a baseline neurocognitive assessment of their brain that can help healthcare professionals track recovery of cognitive processes following a concussion, and special Concussion Goggles distributed to K-8 students in schools to simulate the sensation of a head trauma. There’s more to the Duerson brothers story. Like Dave, Michael suffers from Accumulative Concussion Syndrome (CTE is often diagnosed after death). Michael’s ACS is not from football, but college basketball. In 1977 when he was 18 and playing for Indiana University Purdue University Indianapolis Michael says he was making a defensive play to block a slam dunk by planting himself in the middle of the lane. The other player rammed into his body shattering the hard contact lens in Michael’s right eye. Teammates told him his feet went straight up from the floor and he landed on his head. Michael returned to the game but suffered a career ending injury in his second year. He says he devoted the remainder of his college time to his academics. He was allowed to keep his sports scholarship and received a degree in Industrial Management in 3 years and 1 semester. Dave was on call to address his brother’s injuries. Having come from a family of athletes on their mother’s side (Houston Rockets Allen Leavell is a cousin), and their father, who was 40 when Dave was born, could outrun his son until he started his NFL career – the idea that Michael was suffering physically and mentally from a sports injury was unthinkable. The football players mentality and “Gladiator” culture of the game sustains the belief that the damage of multiple head traumas is more associated with a player’s physical and emotional limitations and not the actual risks of the game. It is also the fear that something you love, that you put your heart, soul and body into may permanently debilitate or potentially kill you. Will we remember when the New Orleans Saints were exposed for their “bounty hunter” plays in 2012? Defensive players were given cash bonuses for taking a player from the opposing team out of the game for the season with a crushing “knockout”. Michael, now 57, says he turned his medical power of attorney over to his brother Dave for 23 years. Michael was able to achieve success as an engineer despite his suffering and multiple medications (up to 20 pills a day) and their side affects. He says he’s now able to sleep thanks to the successful treatment of a psychiatrist. “Most professional athletes (Gladiators) don’t approve of treatment because it implies weakness. As my boss he [Dave] said I was weak mentally. He was my Medical Power of Attorney. I chose him because I knew that he was one family member that would ‘pull the plug’ without hesitation thereby not wasting lots of money on medical bills. Dave knew more about mental health than the average person. During the 23 years he was my Medical Power of Attorney I voluntarily went into the locked psychic department 18 times. 2011 would be a crushing blow for Michael and the Duerson family. Michael forced to give up his duties as a turnaround professional for non-performing plants was ruled by the U.S. government as “gravely mentally disabled” and unable to perform the duties due to his symptoms. 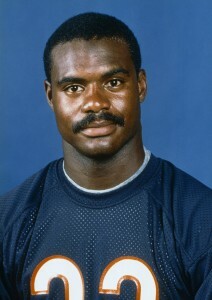 That same year Dave Duerson left a note for his family to donate his brain to Boston University’s brain bank for further study before shooting himself in the chest. 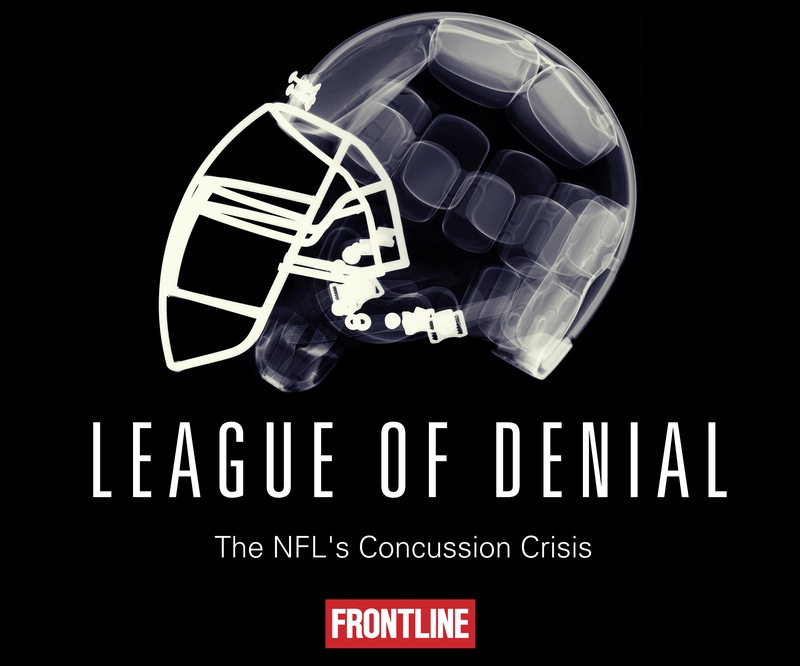 Several years ago while channel surfing in search of entertainment I happened upon the PBS series Frontline and their [Peabody award winning documentary] “League of Denial: The NFL’s Concussion Crisis” based on the book by Mark Fainaru-Wada and Steve Fainaru. A documentary isn’t usually my first choice on a sleepy evening of television watching. But the story was so compelling I put the remote down. I even jumped on social media to alert friends on Facebook. Eventually one of my Facebook friends would introduce me to his cousin Michael Timothy Duerson. I have few arguments with the film Concussion related to the events of the CTE story. In fact, I felt a great sadness as a Steelers fan during those glory days knowing the defensive wall of steel and some of the greatest human drama on the field, resulted in one of its greatest tragedies. According to some reports of last week’s playoff game between the Steelers and the Bengals, history may repeat itself based on the helmet-to-helmet bashing play that made Bengals fans livid. 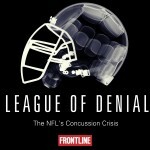 ESPN pulled out of the collaboration with Frontline for “League of Denial”, but allowed Frontline to use their sports footage. Questions continue to circulate about why Elliot Pellman, a rheumatologist by profession, is still on the NFL’s Mild Traumatic Brain Injury Committee. “We’re not saying people have arthritis in the brain,” Michael told me over the phone. Neither is anyone saying sports-related brain trauma is limited to football as Michael’s story illustrates. Michael says he’s also requested for his brain be donated upon his death to the Boston University brain bank since he and his brother Dave “look like twins” (that’s for sure) and “probably share similar DNA”. It’s understandable the children and other family members who loved and admired Dave Duerson would want to see him as a hero on the big screen. Not being close to the individual, and having seen the Frontline documentary before the feature, I saw no Duerson villain. I saw the pain of fighting against the culture and protecting the game that gave you the ultimate feeling of being alive. In the final scene the Gladiator falls on his own sword in what this story paints as the noble sacrifice. Will parents pull their kids out of school football as a result of the CTE debate, or seeing the movie, maybe the documentary? The Dave Duerson Athletic Safety Fund, Inc. is advocating for students to play flag football until they’re 14 years old before making tackles in the game. The Dave Duerson Athletic Safety Fund, Inc. is not affiliated with the appeals process or seeking settlements from the NFL. The Fund is independent of those activities, as well as family foundation activities by Dave Duerson’s ex-wife and his children. Dave Duerson’s greatest legacy can be preventing the outcomes that forced him to take his own life, and his brother Michael continues to suffer. For me facts will mean nothing if we continue to intentionally or blindly repeat the mistakes of the past. We should mean it when we say, “Let’s do it for the children”. David Bowie pushed the boundaries of music, art, life without ever falling over them. Were there ever any boundaries to begin with? His artistry was that fluid and beautiful. 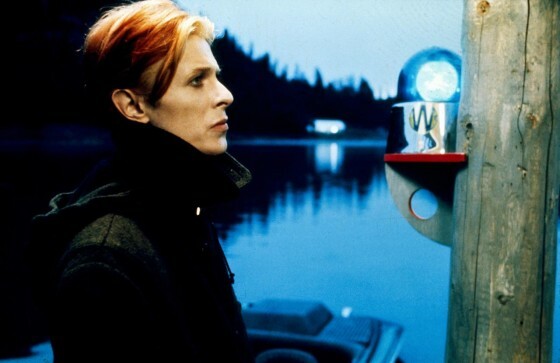 And now the Man who fell to earth has rejoined the stars. In the 1980s, Joseph Campbell was an inspiration for George Lucas‘ Star Wars saga. Like Yoda, Joseph Campbell is no longer in our galaxy in the physical sense. George Lucas remains. Now that he’s sold his Star Wars children to Disney, like Luke Skywalker, he’s entered a new phase of the hero’s journey. This interview with “Charle Rose” was broadcast over the Christmas holiday.